We left home this 4th of July morning to go for a walk and have breakfast. We drove through Graton first to see if by chance Willowood Cafe was open, no such luck. Continuing west on Graton Road we thought we could possibly get in to Howard's Station in Occidental. It appeared by the line outside that all of West County had decided to have breakfast at Howard's Station. 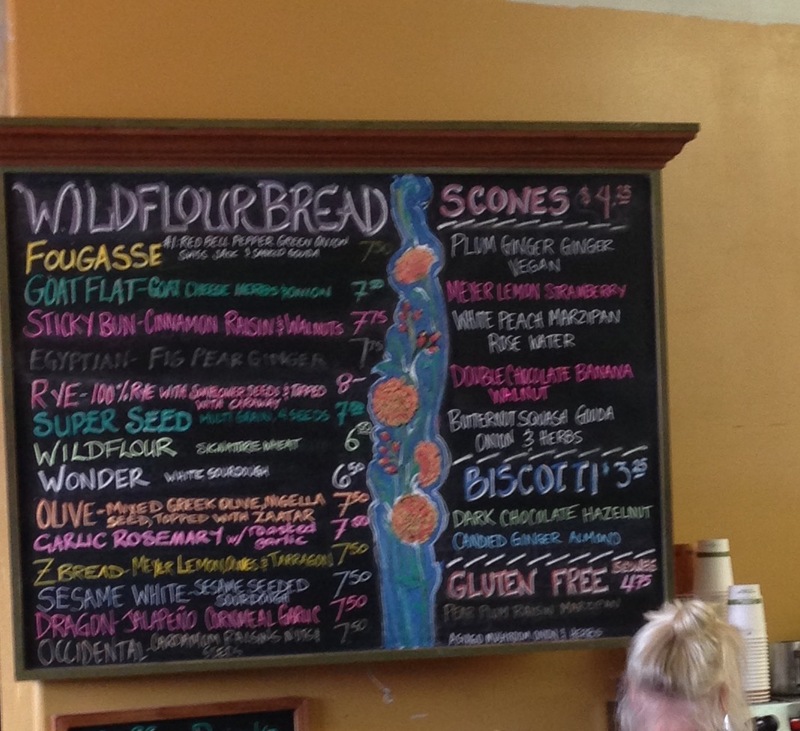 Our next option was to hope that WildFlour Bakery in Freestone would be open and not too packed. We lucked out, they were open. Near the cash register they have several of their fresh breads cut to be sampled. 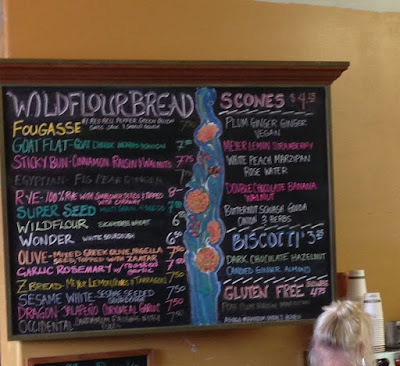 I tried 2, and the Egyptian fig, pear bread. I love something sweet with my coffee, so I decided to take home a loaf of the fig pear bread. Took this shot so I can try to recreate these treats! We ordered one white nectarine, marzipan, rose water scone and one strawberry lemon scone and a latte, the tab was a bit over $20.00. Ordering one scone and sharing it would have been plenty, but we each wanted a different kind, besides, Mark ended up eating another half after our stroll. We walked down Bohemian Highway and lucked out, the gate to Osmosis Day Spa and Sanctuary was open and a woman who worked their invited us in. 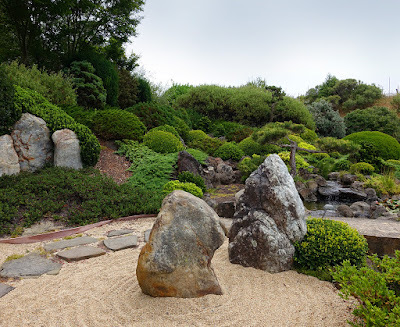 We strolled the meditation garden. What a peaceful way to spend the morning. As we walked back to our car I noticed the garden behind the bakery and we decided to stroll through it. 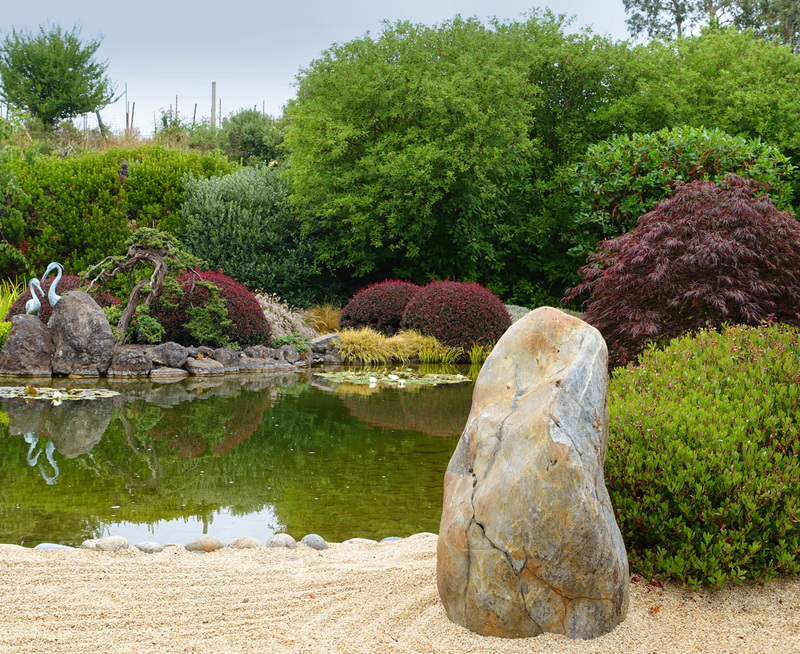 Wow, what an impressive garden! Lots of berries, raspberries and boysenberries. 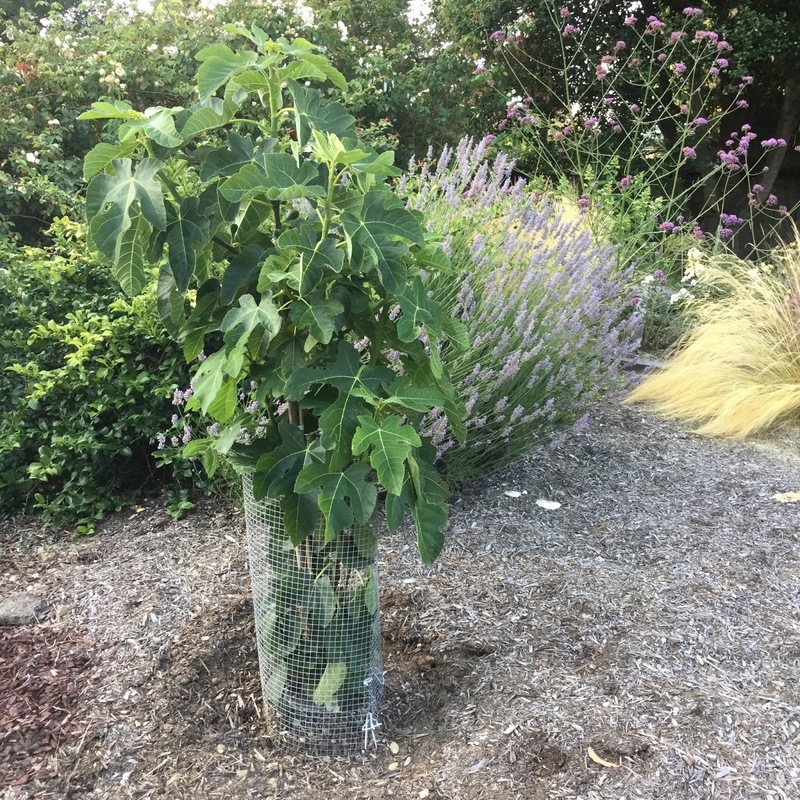 A growing arbor with kiwi that looked like they were just planted, lots of lettuce, peas and herbs. Not much walking, but a fun Forth of July morning. 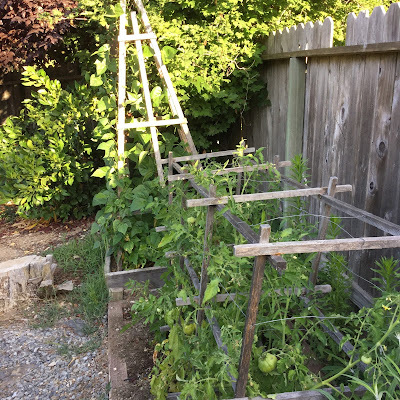 Mark is trying to convince me to move my blog to Facebook and suggested I do a garden post. Well, its not moving to Facebook, but a garden post seems like a good idea. It sounds like such a great idea that I think I'll try posting the end of each month during most of the year as away to keep track of garden happenings. The squash have been the star of the garden the past 2 weeks, producing every day. 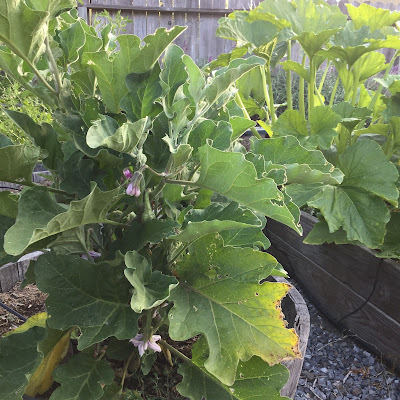 The zucchini appears to be slowing down, but was a heirloom variety, Cosata Romanesco. 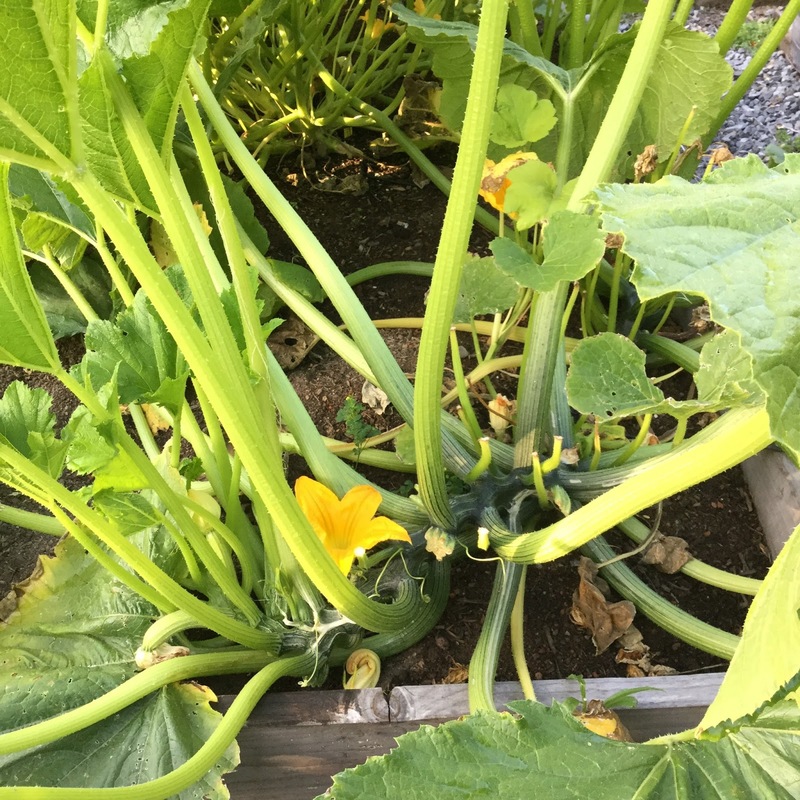 The description reads, "Italian zucchini with nutty flavor and exceptional texture. Gray-green skin and prominent ribbing." I may have to try to harvest some seeds so as to be sure to have it again. 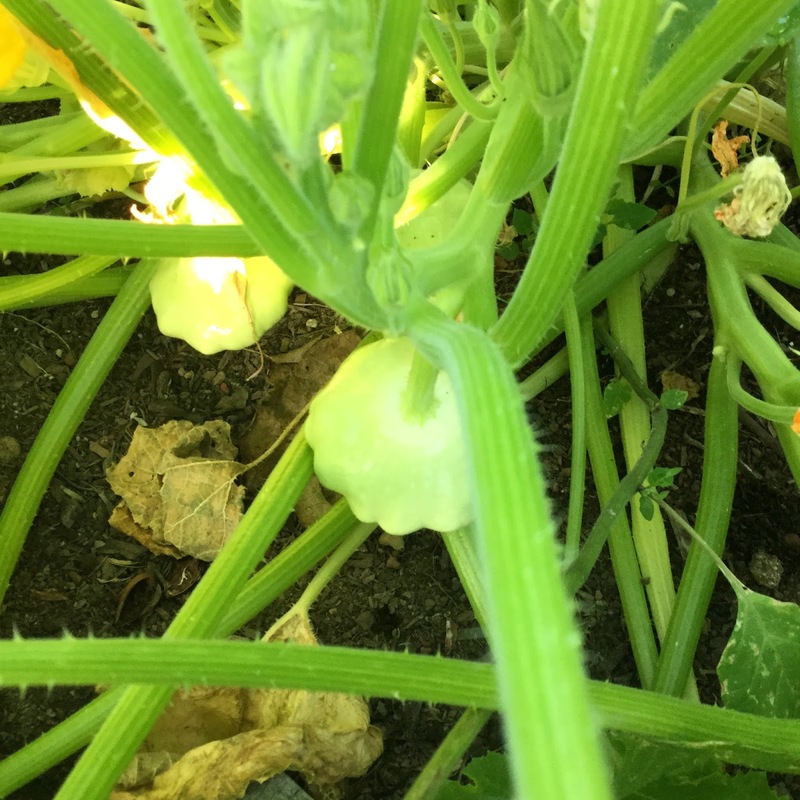 Crookneck and Patty Pan squash are beginning to bare heavier. 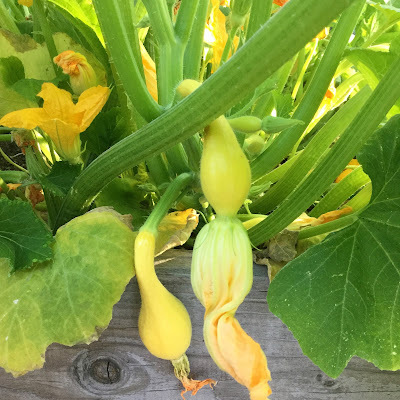 They are are my favorite squash, I love to just steam the two together. Another of my favorite ways to fix the Patty Pan Squash I gleaned from my friend Candace, slice it thin, dip it in buttermilk and breadcrumbs and bake. We've already had this twice and should have many more! The tomatoes are small and beginning to set. I planted 2 Cherokee Purple, they have a wonderful flavor, but don't always bear heavily. I also planted 2 New Girl and a Roma. At this point they all have green tomatoes of various sizes. They have loved the warmer nights we've had. I have one cherry tomato, Chocolate Cherry, described as being delicious and multifaceted flavor, super productive, but it's slow. Usually cherry tomatoes are here long before the others, these don't look soon to be ready. 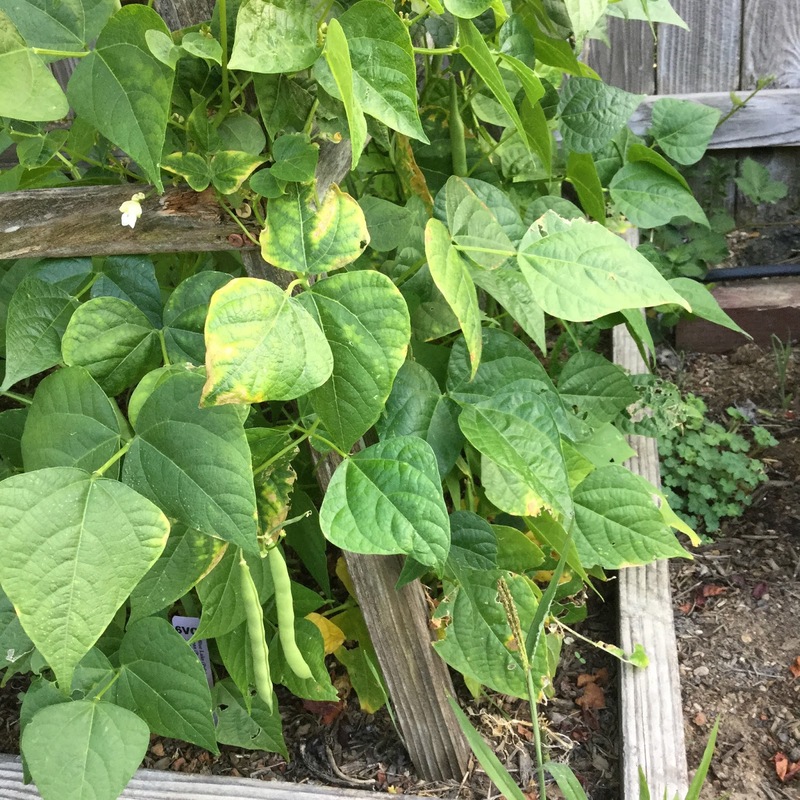 When I took this photo this morning I noticed that I had a few beans ready to picked. Upon a closer inspection, I found a whole handful and it looks like there will be another tomorrow. The beans are on their way! 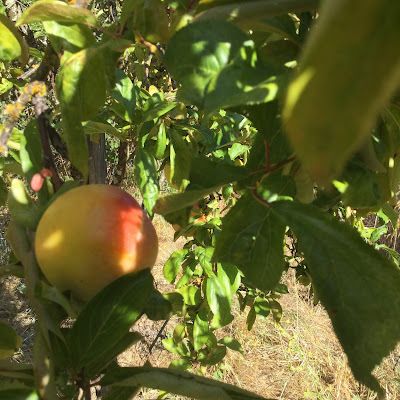 I was surprised to see this fruit on the Rosa Bianca plant, they usually don't start to bear until later, but the news said we've had more warm days in June than normal. 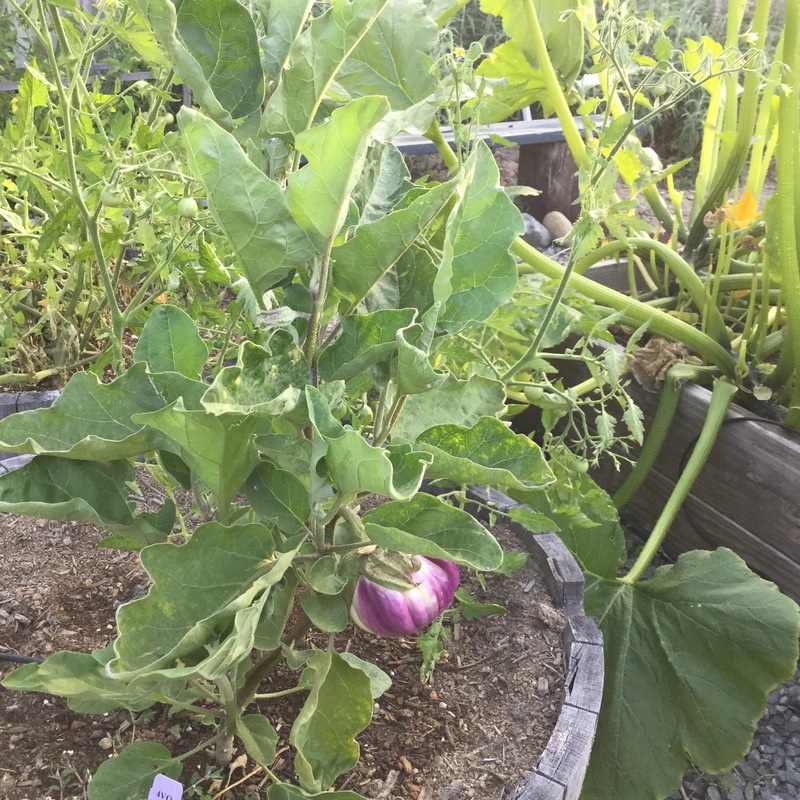 Hopefully all the blossoms on this Black Beauty Eggplant will set fruit. 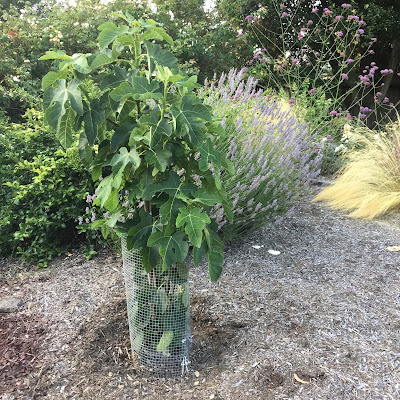 This plant is also doing well because of the lack of June gloom. 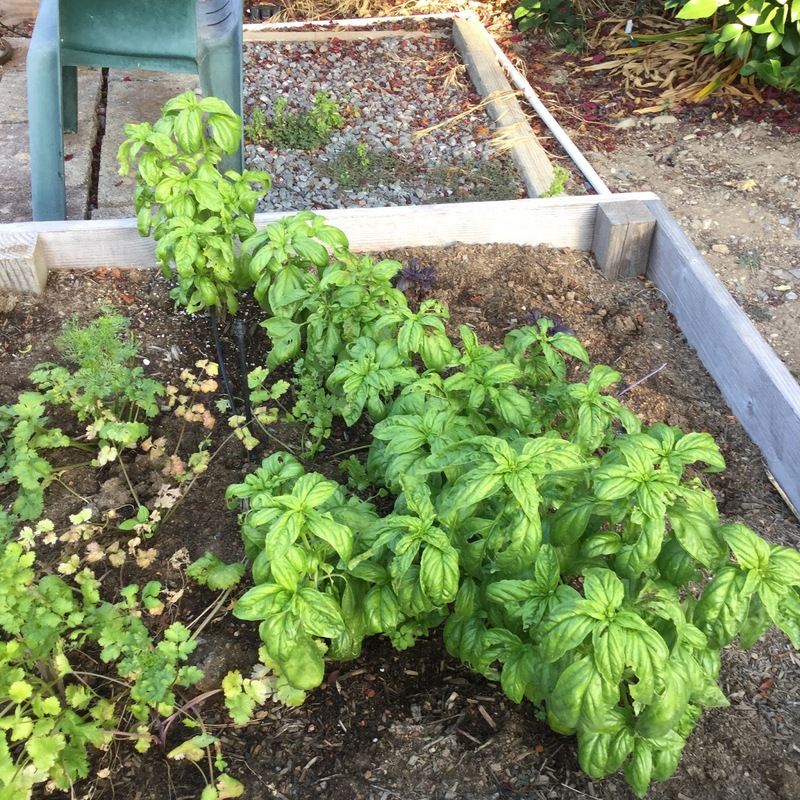 The basil in this picture came from one pot from Trader Joe's, a better value than the pony pack from Harmony! Next to it is the volunteer cilantro that has done much better than when I planted it originally. As some plants go to seed, there always seem to be a few more babies. I expect that the warmer weather will stop that. Somehow I lost the other end of this bed with my peppers, 2 Pablano and 2 Padrons. There are a few smaller sized Poblanos and Rob picked 2 Padrons, wonder if one will be hot? You can see the weeds trying to take over the herb garden again. I think this soil had too many weed seeds in it from being stored in the back yard, I am continually battling the weeds. 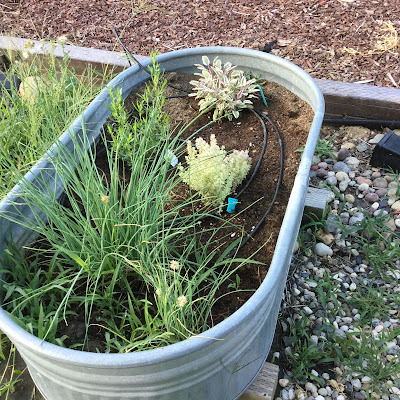 The chives are a few years old, the thyme, tarragon and sage were all planted this year. In the salad garden I planted Mesclun Mix and Arugula from seed. 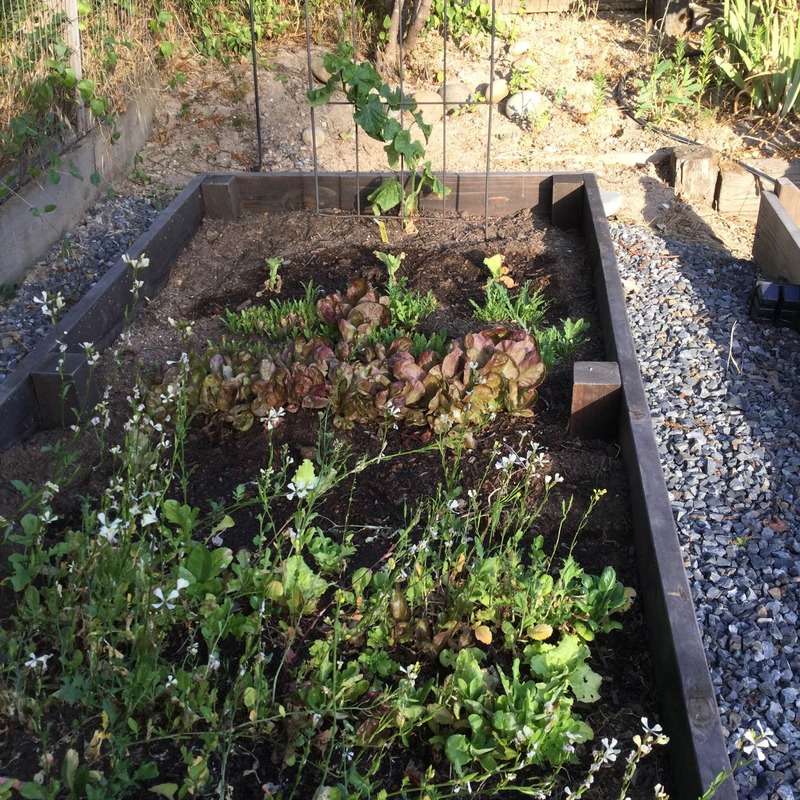 The Mesclun Mix in the foreground has some lettuces that are going to seed and some that are still plugging along. 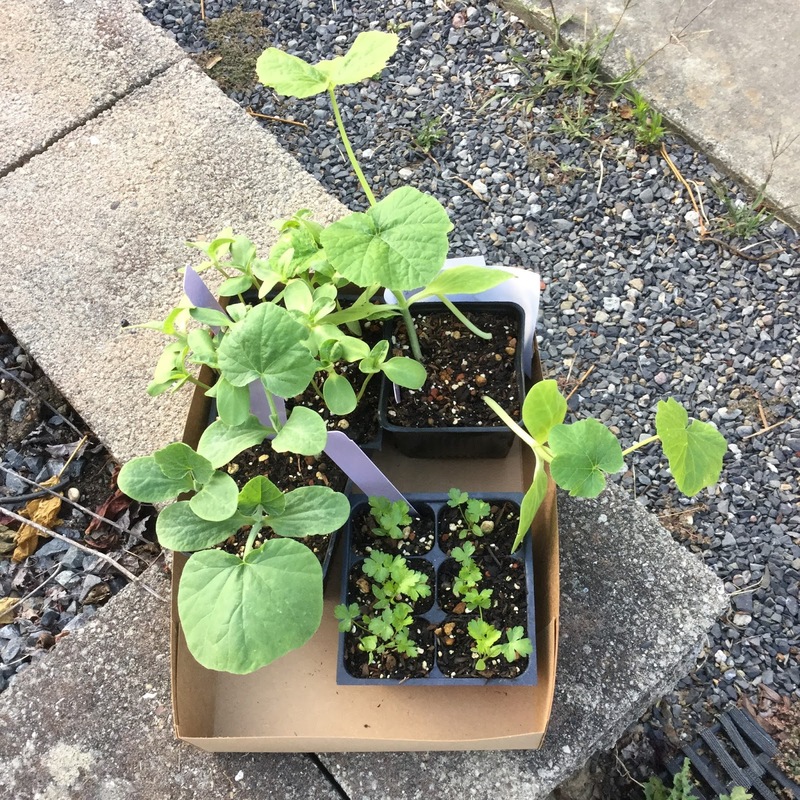 Behind those are a couple of slow bolt leaf lettuces that I just planted, red leaf butter head that are slow to form heads and Arugula that doesn't act like its going to get much bigger. At the end of the bed is a cucumber. Last year this Howard's Miracle Plum Tree didn't have such a big crop, but the birds really enjoyed them. This year I'm doing battle with the birds to get to enjoy the crop. Last night I covered it with netting and tied sliver ribbon on it to detour the birds. I'm praying that it works and we get to harvest this years crop. Look at this beautiful succulent plum, the birds have already started to feast and they aren't even ripe! 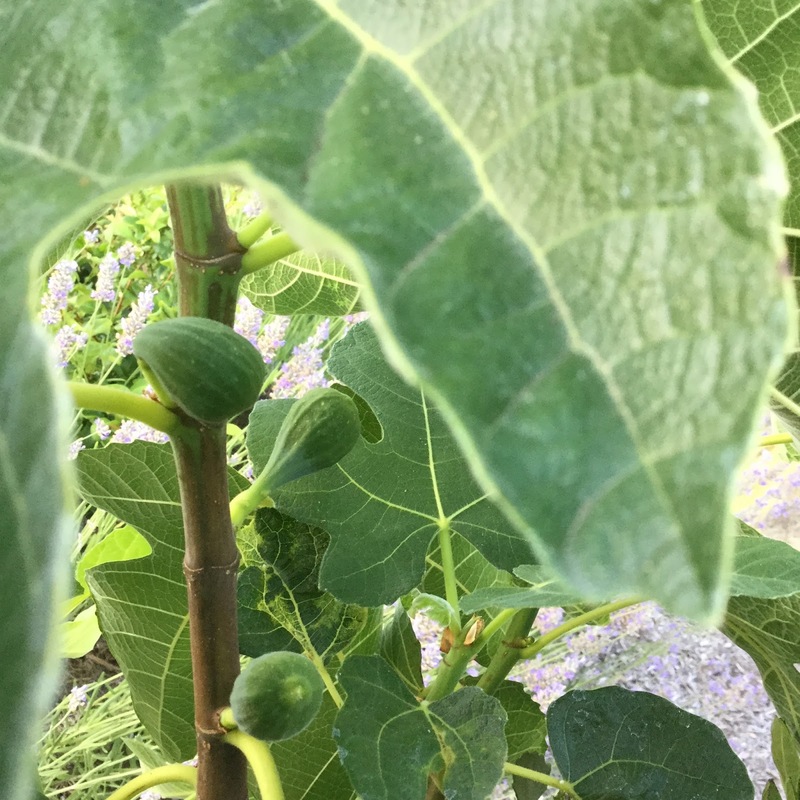 I can't remember the name of this fig, but this is the second one I have planted. Around the trunk is the extended gopher basket to assure that no gopher crawls over the side and enjoys its roots. As my mom would have said it's loaded with figs! As my mom would have said, "It's loaded with figs!" 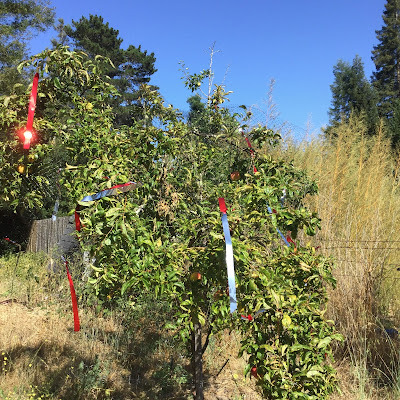 While we were in Southern California over Father's Day, the berries suffered in the heat and hadn't had consistent water. In spite of the hard ship I've picked 2 and a half quart size freezer bags full, plus a few here and there to throw in with a fruit salad. My poor strawberry patch also suffered from lack of water this month and was full of weeds. I found it and it now has a few strawberries and seems to be on the mend. No Balsamic Strawberry Pepper Preserves will be coming from this patch this year. 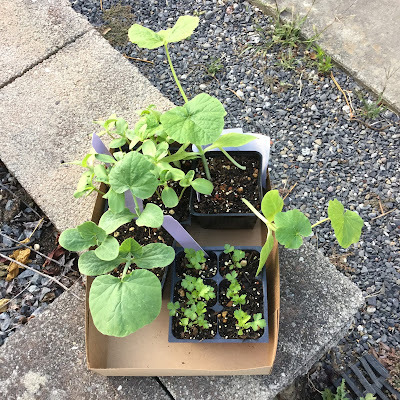 Besides getting this blog post together my chore for today is to plant 3 pumpkin plants, 3 butternut squash plants, 6 Italian Parsley and oodles of giant sunflowers, hopefully they'll be around next month! 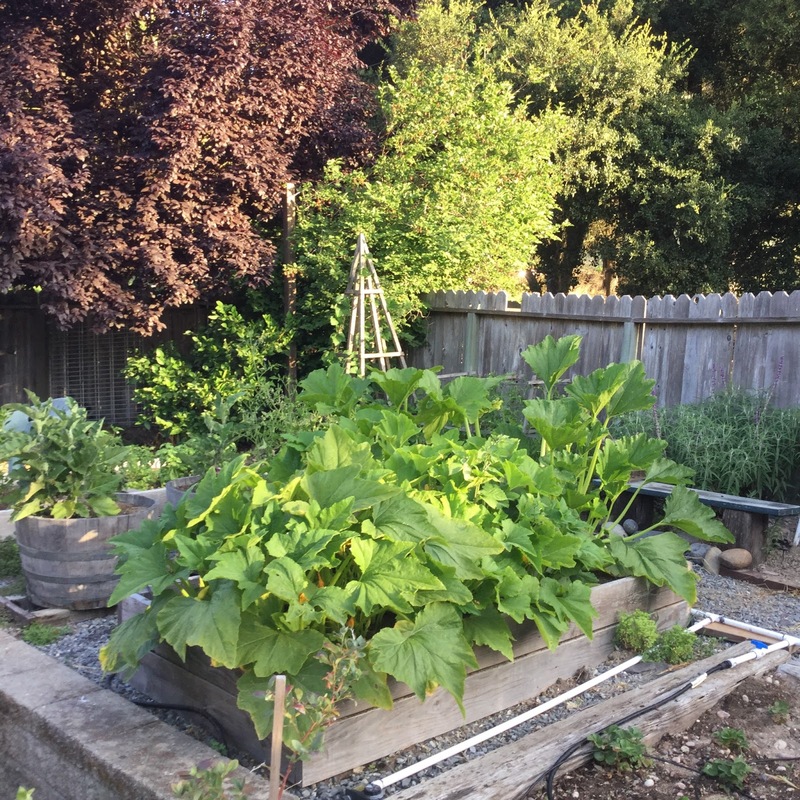 That's the garden on the last day of June of 2016. What a pleasant surprise it was yesterday while shopping at Costco to find Copper River Salmon. I remember about 10 years ago when we were in Alaska passing the Copper River and seeing the fisherman standing in the river waiting for the salmon to bite. 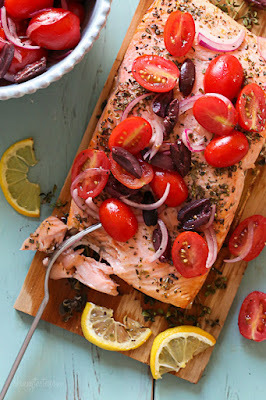 This has become my go to recipe for salmon because if its ease and the ingredients, except for the salmon are either in the house or easy to grab at Andy's. We've always placed a couple of hearty sprigs of rosemary under the salmon which gives a delicious rosemary flavor to the meat. I think next time I may try basil fresh from the garden. Last night I had I fillet about the size of a large cedar grilling board and, unfortunately, no relish left over to go with the leftovers. It's a hit with the men in this house. I had no opportunity to take my own picture so I borrowed a picture from Skinnytaste.com, one of my favorite blogs. Hopefully next time I will remember to snap my own photo! Soak plank in water 1 hour. Slice half of lemon in this slices. Season salmon with remaining 1/2 lemon, salt, .oregano and black pepper. Cover a refrigerate until ready to grill. In a medium bowl combine tomatoes, onions, olives, olive oil, salt, pepper and vinegar. Place herbs and salmon skin side down, on plank. Top with lemon slices. Heat the grill to medium high, leaving some indirect heat. Close lid and heat. Place empty plank on hot side for 3 to 4 minutes, until the plank starts to smoke and gets a little charred on bottom and edges. (Check to make sure the board doesn't ignite. Transfer plank to indirect heat side, cover and grill 12-15 minutes, depending on thickness, or until cooked through to preference. When cooked top with tomato mixture and serve. Early this spring I roasted some strawberries with balsamic vinegar for a strawberry cheese cake I made for a Memorial Day barbecue. The cheese cake was too rich for my taste, not a keeper, but the roasted strawberries were delicious. This caused me to search for a roasted strawberry syrup which I could can now while strawberries are plentiful. 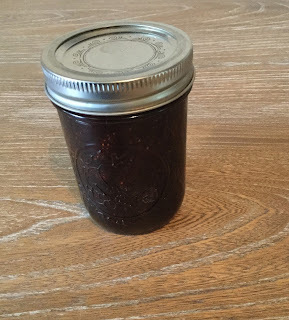 I never found a recipe for canned roasted strawberries, but instead found this recipe for strawberry preserves for serving with goat cheese as an appetizer. The pepper adds a nice kick and a bit of interest to a type of jam that is not usually my favorite. I plan to make another batch, possibly with brown sugar rather than white to have on hand for gifts. I served it to my book club on a log of goat cheese, next time I'll try on some brie. In a small sauce pan bring all ingredients to a boil, stirring and skim surface. Simmer mixture stirring and skimming surface for about 15 minutes ( I cooked about 35 minutes), until thickened and translucent. Remove pan from heat and cool preserves completely. Preserves keep covered and refrigerated one month. I tripled the recipe using 6 cups of strawberries and used a large pot after it boiled over in my largest saucepan. I cooked quite a bit longer because I wanted a thicker product. I also ladled it into 5 half pint jars and processed in a hot water bath for 10 minutes. 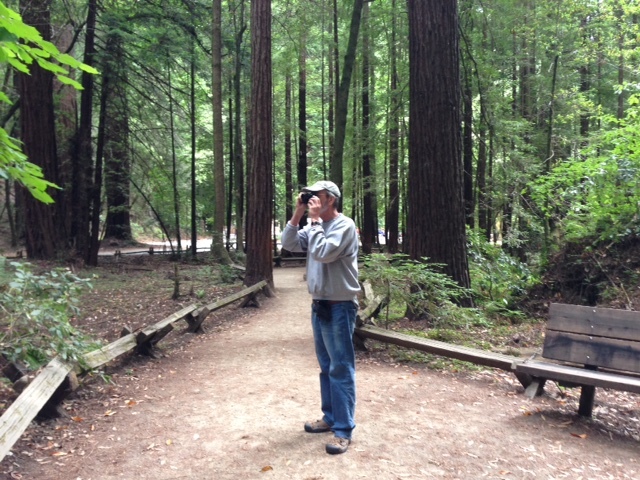 We have decided to get out and explore the trails of Sonoma County now that I have an endless summer vacation. 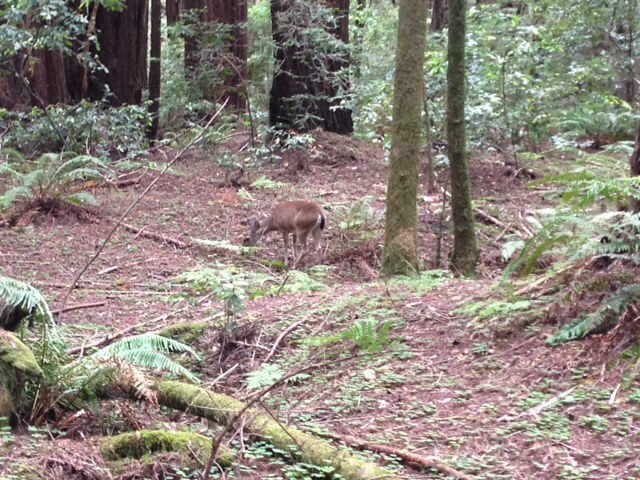 What better first trail than Armstrong Woods. We started out gently hiking from the parking lot at the Visitor Center down the Pioneer Nature Trail to Redwood Forest Theater Road to the theater and down the Armstrong Nature Trail to the Pioneer Nature Trail back to the Visitor Center, a distance of one and a half miles. Of course, it was a photography walk. The morning was overcast, in fact as we approach noon at home the sun is just beginning to poke it's head out from the clouds. This was definitely a serenity walk, as we had the park all to ourselves, something we're not accustomed to on our weekend visits. 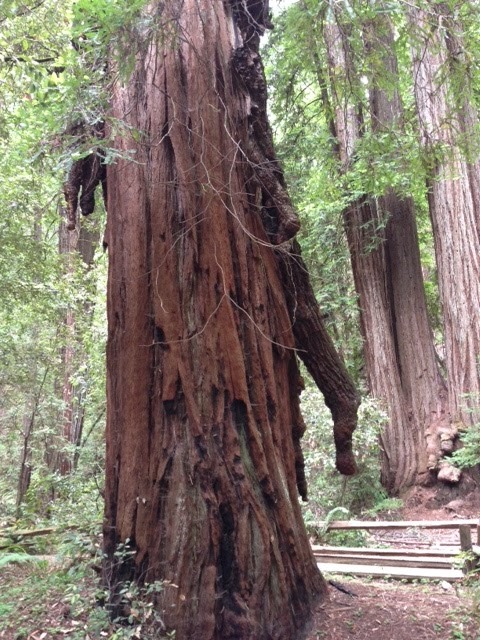 This tree reminded me of all the burl I photographed on the Olympic Peninsula last summer, not realizing we had our very own redwood with burls at home! 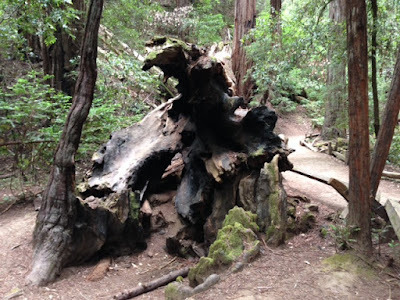 This tree had its burls stolen by poachers to be sold and this is what remains of what used to be icicles. The burls are caused to grow because of stress to the tree from fire, flood, wind, earthquake and logging. The burls are an example of the resiliency of the Giant Redwood. Could this be the Ghost Tree? About 20 years ago when we were at the picnic grounds grilling dinner, Rob went off on a different trail than his cousin Bryan and friends in search of the "Ghost Tree". 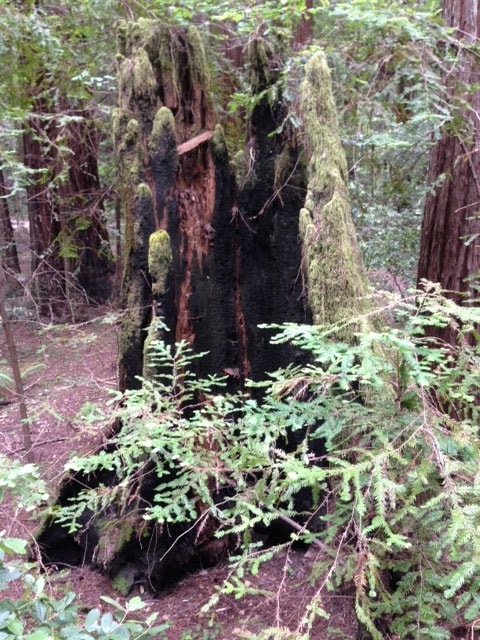 As I came across each burnt out trunk I had to wonder if it was the infamous tree. The path ways are all surrounded by wood railing that didn't exist at that time. I even learned something new! As we were walking back towards the car Mark exclaimed, "We've probably been to this park 100 times in the last 26 years and never really seen it!" We are blessed to have this gem only 20 minutes from home. I love the hazelnut granola that I buy locally at Andy's and pay about $5.00 for a fist sized bag. A few years ago I baked my own granola regularly using a recipe that uses applesauce rather than oil. I got out of the habit of making it and bought Trader Joe's instead. A few years a go Candace sent us home from a visit with a small bag of this homemade granola. It was yummy, so I've adapted the recipe fo be similar to what I purchase at Andy's by adding toasted hazel nuts. While traveling we often get up and want something easy to eat as we go, that portion of this batch has tiny chocolate chips added. This with yogurt fills that need well. In a large bowl combine first 7 ingredients, oats through dry milk. Mix well. In a separate bowl whisk the salt, oil, syrup and vanilla. Pour over oat mixture stirring and tossing until everything is well combined. Spread in a couple of large lightly greased baking sheets, I used parchment. Bake in a 250 oven for 2 hours tossing and stirring every 15 minutes or so. Remove from oven and cool completely. Transfer to a large bowl and mix in desired dried fruit. As we travel it's always nice to have some food along that's been prepared ahead of time. This year I've gone so far as to begin prepping 2 weeks ahead. I had a carton of whipping cream in the refrigerator that I had planned to make into scones, but had not yet gotten to it and the expiration date had past. A quick sniff told me it was still fine so Scones would be the first make ahead, some for breakfast and some to freeze for the trip. This recipe from my friend Candace has become my go to breakfast treat. I keep trying new additions. The recipe is the original, I'll post my variations below. Preheat oven to 400. Whisk first 3 ingredients in large bowl. Stir in walnuts, apricots and raisins. Add cream; stir with a fork to just blend. Transfer dough to work surface sprinkled with powdered sugar. Knead dough until smooth, about 10 turns. Form dough into 1" thick round. Cut into 6 wedges, I usually do 10-12. Sift powdered sugar over. Transfer to baking sheet. Bake scones until golden brown and toothpick inserted into center comes out clean, about 18 min. Serve warm or at room temperature. temperature. I've had good luck freezing for short periods and reheating. *3/4 a cup of diced candied ginger, 1 tsp powdered ginger and no nuts. My husband and I moved to Northern California from the Metropolitan Los Angeles area (Orange County) in 1989 before the birth of our daughter and when our son was about to enter kindergarten. 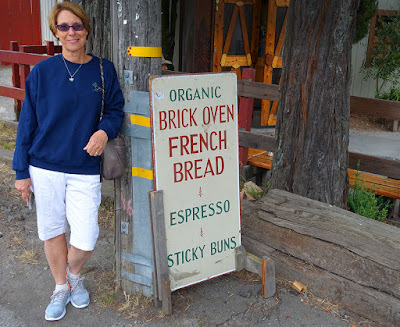 We liked the small town, slow paced life style of Western Sonoma County. As a stay at home mom I spent hours cooking, until I returned to teaching when my daughter was 2. 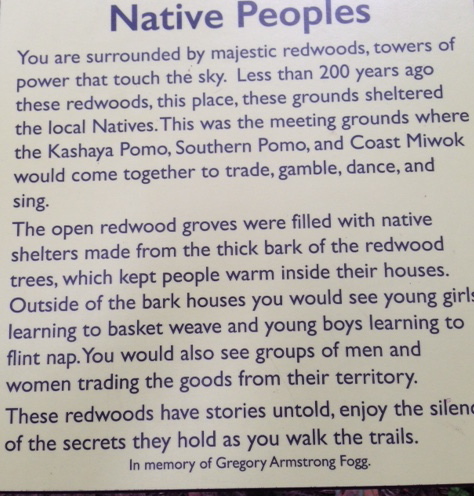 For the past 18 years I've taught in a low income neighborhood in Santa Rosa. I've seen the population of the school change from multi-ethinic to primarily hispanic. I love helping my sixth graders achieve their best potential and wouldn't teach anywhere else.